Doesn’t matter whether you want to get a job of customer assistant, sales associate, stocker, or assistant manager–the first interview will always be the same. Why do you think you can be a good stocker? Talk about your sense for responsibility, good physical strength, attention to detail, your experience with similar work, etc. Show some confidence and self-belief. Why do you want to work for us, and not for someone else? A tough question, becasue you probably do not care much. You can say that you like the location of the store–perhaps it is close to the place where you live. Or you can emphasize your preference for their brand, for what they do in a store. Another option is to refer to a personal recommendation–your friend worked for them as a stocker (or on any other position), and they recommended you the job. What do you think is a main duty of a stock clerk? To ensure that the shelves they are responsible for are always stocked with goods, that no items are missing, and consumers can see all items clearly. What were the most difficult situations that you encountered and the simplest way you used to solve them? Tough question to answer, you have to speak from your experience. But the key is to show them that you can decide independently, and solve a problem, without a need to always consult your supervisor or a store manager. When in your last job did you go over and above of what was expected? If another co-worker were gossiping about someone else something which was untrue, how would you react? If a customer accused you of a bad customer service, what would you do? If a supervisor asked you to change the way your job was performed even though you knew you were doing it right, what would you do? What can you improve about our store? This job is a routine work. What would motivate you to do it well every day? 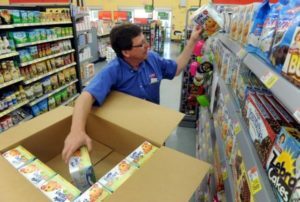 * If you are preparing for an interview with one of the retail giants, we suggest you to have a look at Walmart Interview Guide from Jacob Gates (reputable carer coach and guest author for InterviewPenguin.com). Jacob has helped hundreds of people to succeed in their interviews, showing them great answers to interview questions, and teaching them winning interview strategies. If you apply for a job in a smaller company or store though, please continue reading the text below. If you apply for a job in a small company, you will not deal with tough behavioral questions. More often than not, you will be the only applicant for the job (or one of the few). Tell us something about your previous working experience. What would motivate you in this job? Have you done this work before? Can you lift 20 kilos? Would you mind working overtime, night shift? Decent answers to these questions, and a good conduct in an interview will suffice you to get the job. Listen carefully to their questions, answer to the point, be polite and friendly. Most common questions and answers – Test the waters, learn what matters for the interviewers and how to answer the most common questions. Salary negotiation tips – Basic rules you should remember when negotiating a salary in your interview. Learn how to get what you deserve, or at least a bit more than what they initially offered.